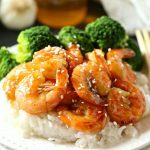 This Easy One Pan Honey Garlic Shrimp is a delicious Asian-inspired meal idea with the perfect honey garlic sauce. And it's made with simple ingredients in 15 minutes or less! In a small bowl, whisk together the honey, garlic, rice vinegar, sesame oil, soy sauce, water and cornstarch. Set aside. Heat a large skillet over medium-high heat and add the olive oil. Add the shrimp to the pan and toss in the olive oil, allowing the shrimp to cook on each side for 3 minutes, or until all sides of the shrimp are pink. Shrimp without tails and shells will cook more quickly than shrimp with the tails and shells on. Add the honey garlic sauce sauce mixture and toss the shrimp in the sauce until the sauce thickens and becomes sticky. Serve the shrimp over rice with a side of steamed veggies and a sprinkling of toasted sesame seeds, if desired.